Today we present some useful free CSS/(X)HTML templates which are available for free download and use. You may want to consider using them for your next projects or build upon them, creating more advanced themes from these basic templates. 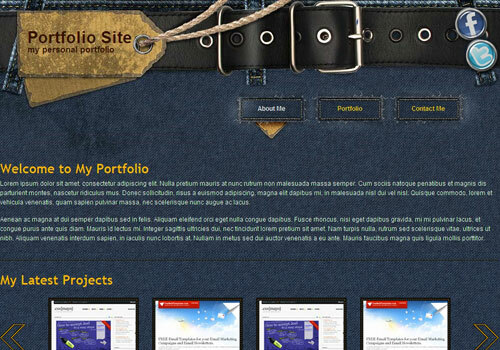 Stand out from the crowd with this cool, free template for a portfolio website based on blue jeans texture. An HTML 5 and CSS based website template suitable for businesses. It has a jQuery slide show in the home page header for displaying your latest work, featured contents or can also be used to tell your visitor what your web site is all about. It can be useful if you need to show case your work / portfolio. Most of the style elements are in the CSS including styles for Blog, Comment Template etc. It has been designed with tones of blue, white and a bit grey to point out the gadgets and provide more usability that you can obtain information you need faster and more easily. You can display all gadgets you are selling. This blue colored well designed template can be used by people doing business. It has been designed so that it is suitable mostly for major/indie music recording companies, bands, musicians, music products affiliates, music event organizers or simply online music stores. This template will go extrremly well with suitable Blogs, Small Websites etc. A smart template, it can be used by service sector industries and persons like event management compnies or graphic designer firm. It features a narrow, one column layout with minimum graphics, clean and legible typography. This template gels well with person/firm in service sector. This template is created keeping in mind property selling/buying sites and its quite neet. As the name suggest, this can be used by FM or radio stations. This template can be used for some design or lifestyle related website and it gives a contemporary look. A blue colored template, it tends to give all the necessary information to clients at one go. This template can be used for websites with loads of information or which issuing articles/tutorials on regular basis. Great free html template for on-line shop dedicated to the urban fashion industry. Remove the slider area and use this template as a start point for your on line business. This format is most suitable for blogs related web sites. Simple corporate CSS/XHTML template ready to meet wide range of requirements for effective on line performance. Easy Slide is a simple but cool css template based on the famous Coda Slider. Studio Click is a simple, well-structured portfolio theme that focuses on one thing: gorgeous photos, screenshots, and content. It displays works easily and stylishly using large images of your products. Photo Pro is a simple css template for portfolios and photo sites and it’s very easy to edit. This facinating template can be used by blogs and or some stock photo sites. Great free html template for on-line shop. Use it as a start point for your on line business. The Blog page features a simple blog design, easy on the eyes, allowing you to express your thoughts freely and in a stylish way! This template gives us a break from usual design and cn be used by service industries providing 24*7 supprts. Color of this template is easy on eyes and is stylish. This template can be used by business sites and it is very attractive. It is clean and has a lot of whitespace and nice typography. The code is well-organized and uses standards-based HTML and CSS. This template can be best used to showcase your idea and ideation process. This is a clean and professional looking template for small portfolios or business sites. Very easy to edit if you have a basic understanding of html and css. It can be used to showcase the reasons to prospective clients to choose you. This is a simple but beautiful css template with lots of whitespace and a professional look. Perfect as a frontpage for small businesses or photographers. Impress visitors to your site with a high-quality one-page portfolio site inspired by the Japanese ninja culture. You can use use Kelontong WordPress e-commerce theme to modify your store and sell more of your products. This is suitable for small scale business websites that don’t need a lot of pages. Its a attractive template using combination of white & bright colors and css techniques like Box Shadows and text shadows. Very nice collection, especcially the apps templates, this can be lifesavers sometimes. Beautiful templates. Thanks for sharing. Hey, I developed a free template too, if you are interested here it is http://bit.ly/bYhDXs Its a minimalistic template featuring HTML5, jQuery slider and Php contact form. Beautiful and creative examples. My two favorites are “Clean White” and the blue jeans one. thanks for adding my templates. although some of them were from 2009 (Bamboo, Reinvent etc.) and the rest of them looks great too. Blue Jeans and Ninja Assassin are my favorites. Love the site! Thanks for all the free templates. Any body know of a great place to have these turned into wordpress templates at a reasonable price? I would recommend themelab (themelab [dot] com ) he has converted a lot of my templates into wordpress already. My heart goes out for blue jeans. contemporary one!~! Stunnig Templates here. Thanks for sharing! Thanks for sharing! These templates are awesome. Great List, def some cool stuff out there! Are all of these made in 2010? Great list of templates. Thanks for sharing! Photo Pro download link is broken. Very good collection … thanks! Great to see some E-commerce templates for free. Especially considering these types of design are time consuming to design and hard to get right. I find that free templates like these are invaluable when it comes to mocking up my web applications before I get a proper design for them. Oh, and PS. I hate nerds. Thanks for the collection, love blue jeans one. You done very great job, I am very pleased to see your site. Your uploaded Templates are very use full for me and also who want learn CSS or JQuery. nice,,,i really like it…thanks a lot…for sharing this wwebsite..
why is it that when i click on the “deviseit” template (the second from the bottom) it appears as a different template? i would like to use the template but it comes up as a different one. Awesome Collection. I’m definitely going to bookmark! Some very nice templates indeed. I will bookmark for future reference. I really appreciate to add this article to my web web page. Certainly educational. I really enjoy reading your blog, it really is one of the highlights of my week. I particularly enjoy reading it within my lunch break. i’ve to say…these are gr8…..thnx for providing. A lot of good templates, thx! thanks for nice templates. I used 2 templates my web sites . Gracias por este aporte… muy bueno. I love the list so much, it was very helpful. is this a joke? how come i can’t download any of these templates???? Some nice templates – shame the download links aren’t working :( Please let me know when they are fixed.